Happy birthday Anne Rockwell (Apples and Pumpkins) and Adrienne Adams (A Woggle of Witches). It’s the birth date of Jules Verne (1828–1905), A Journey to the Center of the Earth, Twenty Thousand Leagues Under the Sea, Around the World in Eighty Days. In 1692, a doctor in Salem, Massachusetts, suggests that two girls may be suffering from bewitchment. Read Wicked Girls: A Novel of the Salem Witch Trials by Stephanie Hemphill. Happy Birthday to the Boy Scouts of America, incorporated in 1910. It’s Boy Scout's Anniversary Day. If you didn’t get to it last week, read The Official Handbook for Boys: The First Boy Scout Handbook, originally published in 1911. If you live in New Mexico, today you can celebrate Extraterrestrial Culture Day—established by a congressman from Roswell, New Mexico, to celebrate and honor all past, present, and future extraterrestrial visitors. And if you don’t live in New Mexico, the day sounds so cool that you probably want to celebrate it anyway. No matter where you live, you can read a fabulous new book, featuring the perfect hero for this day. 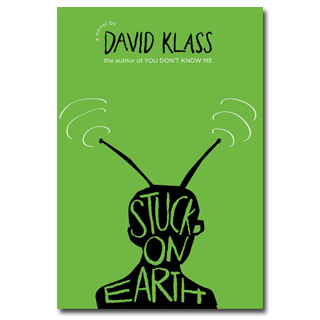 If you believe the narrator of David Klass’s Stuck on Earth, you have just made the acquaintance of Ketchvar III, an intergalactic traveler who has been dropped in New Jersey. He has been sent on an important mission—he must determine if the people on earth should be allowed to live. To understand earthlings, Ketchvar III invades the brain of a fourteen-year-old boy, Tom Filber, someone whose nickname on earth just happens to be “Alien.” A typical teenage boy, Tom deals with a crush on the girl next-door, a lethal mother, drunken father, and sister who does constant battle with him. Ketchvar III, who comes from a peaceful planet, finds all of Tom’s life—including the daily bullying he undergoes—horrific. But the longer our alien stays, the more he grows to appreciate earth’s residents. The school psychologist and Tom’s peers at the school believe that Tom has created an empowerment fantasy to make his difficult life bearable. Because Stuck on Earth is told from Tom’s perspective, you join them in wondering: has Tom really been taken over by an alien—or is he inventing it all? How in the world is Tom, and for that matter Ketchvar III, going to survive on earth even for a short period of time? These questions, and our hero’s attempts to uncover serious ecological damage occurring in his town, form the basis of a very funny, fast-paced, and totally convincing story of a young boy’s adolescent struggles. This book can be enjoyed by ten- to fourteen-year-olds—particularly if on some days they feel like aliens themselves. Unfortunately, Ketchvar III landed in New Jersey. If he had touched down in New Mexico, he’d be celebrated and honored today. Welcome to earth, Ketchvar III—and we do hope you recommend that the people of this beautiful planet not be exterminated. The rest of us will have to read Stuck on Earth to find out what our honored visitor decided. “Do not be alarmed, Earthling,” I say, crawling out of my protective shell. Homo sapiens are large and ugly creatures, but I try not to show distaste. I remind myself that to this human I must resemble the Earth organism known as a snail. Tom Filber cannot move a muscle. Even the pupils of his eyes cannot dilate. Still, the human face is extremely expressive and his terror shows clearly. The paralysis ray did not freeze his major internal organs, and his heart rate continues to climb precipitously. I’m afraid he may undergo cardiac arrest if I do not find a way to calm his fears. Originally posted February 8, 2011. Updated for . Ah, RIF did not realize in selecting today for one of the three book distribution days in the DC Public Schools this year and choosing a “space” theme it would fall on Extraterrestial Culture Day! How smart of Riffington to guide us in that direction! And thank you, Anita, for this additional information we can share with the kids today. We invite all to join us today at 1:30 p.m. EST for RIF LIVE! when a NASA official who is also a former astronaut, Leland Melvin, will be joining us at Ferebee-Hope Elementary School to share his experiences in space and read to the students Diana Hutts Aston’s THE MOON OVER STAR. RIF is defintely guided by some great force! I am happy to hear that you will be celebrating space today, not to mentin Extraterrestrial Culture Day. That is a cool holiday! I think we need more alien books. There was a trend in alien kids tv shows in the late 90s. Maybe it should come back in book form! I agree that this sounds like a really fun holiday! It sounds like a fun book as well with a great concept. I don’t know about kids, but for teens (when I was a teenager in 1999), there was a show called Roswell about three teenage aliens. I was completely obsessed. It would be great if the alien genre became popular again, especially in book form. I will also definitely check out the “Wicked Girls” novel. I love everything about the Salem witch trials. Anita, I have to say this blog is getting to be a habit with me. I love to read about the books I’ve missed, and I adored STUCK ON EARTH. What a great book– and I hadn’t run into this writer before. Thanks so much for the rec!! This book looks awesome!!! thanks for telling us about it. Extraterrestrial Cultural Day?! How did I miss this one? I’m off to find my copy of James Marshall’s SPACE CASE!